Well it's my thrid day in Nairobi and I am starting to feel at home. Maybe it's the rain reminding me of SLE and London or maybe it's the sense of familiarity I have with the office but the adjustement to Kenya has moved much faster then Freetown or even Woking. It's my second day in the office and I have taken a few photos but forgot my download cord so they'll have to wait until tomorrow. The office is a huge house with full garden. It's lovely and homely and the people are terrific and super friendly (and not just because I brought them chocolate!). 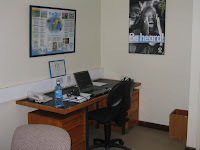 I am working in the Country Director's office (the big boss) as she is away for the month. Hopefully I'll get to meet her on the one day we are both here. 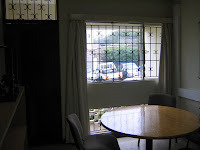 The office is lovely with a huge table, desk and balcony that overlooks the garden. Nicer than any office I have ever worked in at home. . Yesterday for lunch Khalila (my ChildData colleague) took me to the mall. Imagine my shock when it looked like something out of southern california! 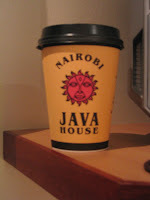 I didn't take photos but will when we go back which we will because we went to Nairobi Java House and I had the BEST coffee EVER! I will definitley grab some beans there when I leave. Hopefully I'll be able to find a coffee maker in Mumbai. We had a great lunch and a really good chat. I am glad I get to spend this week one on one with her. She's a super smart woman and her insight is fabulous! More from me...and photos later. Happy Birthday to Martha! Can't wait to see you and the crew next week a the airport even if it will be 6am!!! Enjoy your day lady! I have to say, that was the least eventful trip I have ever taken from check-in (they took my 28kg bag...need to figure that out for the rest of my trip) to my seat (three to myself) to immigration (she didn't even look at me and didn't put a random date in my visa like they did in SLE) to the cab (he was right there and took me to my door. It was AMAZING!!! I hope my friends who are coming on safari get the same treatment. It was a dark ride through the city to the hotel but I have to say I can tell it is VERY different here from SLE. It actually reminds me of Kelowna (for those of you who have been there). Rural yet urban. The hotel is really nice and my room is adorable. Managed to get on the wireless so that's good too! Working from the hotel tomorrow so that should give me some time to get settled. Not much new to report from Woking. A pretty quiet but terribly beautiful weather-filled weeked. I am not sure how many of you follow natural disasters in the UK but a great deal of this country is terribly flooded right now. We in and around London have been quite lucky. It's been pouring here since last night but I think we'll be okay. The last couple of weeks nearly our entire team has been in Woking which has been amazing. There's something to be said about having actually met your teammates in person. 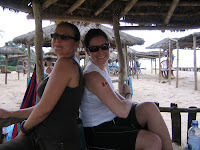 I had the privledge this week of meeting Paulina from Equador and Marte from Norway. I'll try to remember to take my camera to work tomorrow to get photos before folks start going home. It's been a great couple of weeks work wise! So I head out to Nairobi on Sunday. It's nearly a 9 hour direct flight which will be challenging. It's also during the day so that's going to be a bit annoying. I leave at 10am and arrive at 10pm. Fun times. I did however discover that I have a 2 (23kg) bag allowance on all my onward flights so that's good news. I was wondering how I would pack for work in two very different work environs and safari in one bag and keep it under the limit. I hope you are all staying cool! Happy Birthday to Ms Whelan. 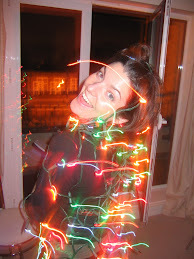 Hope the weekend was 'sparkle hands' amazing! I don't have much exciting to say. 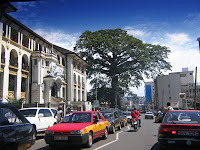 I am 'existing' here in Woking and trying desperately to get all my work done before SAFARI in Kenya in tree weeks. Just wanted to let you all know I am alive. It has been a VERY rough week but I am surviving. Let's just say it's the first time I have really wanted to just go home since I left but you know me...I won't give up...I can't. Here's a photo of the Cotton Tree in SLE for your amusement. The stories say that this is where slaves were bought and sold but also where they became free. Quite a breath-taking image. July 11 - NHS and a Visitor! Two quick notes. First, for all the horror I have heard about the NHS (National Health Service) I was a little worried to try to get to a walkin clinic but I was sort of worried that I had again contracted shingles so needed to get it checked out. This morning I headed to the airport to pick up my special guest. It's been nearly three months since we last saw each other and I am super glad to say that Jay is finally here for a visit! WOOOOHOOOOOO! Now I just need to get my work done so I can head off for a four day weekend with the man-o-my-dreams! Also...a special birthday hi to Jess! The oldest and wisest...right? Love ya! Hovercraft was fit with a set of airplane seats...2 - 3 - 2. It was weird because it was dark and the craft was humming so it was sort of like we were flying. We pulled up on the beach and hopped off and onto a bus. A dutch fellow (who would later be sat next to me on the plane) turned to me on the bus and said 'Are they bringing our luggage' to which I nervously answered 'yes' and then contemplated the process or reclaiming our bags. We got to the airport and waited on the steps for our bags which showed up 15 minutes later. A man walked off with mine as I yelled 'hello, that's mine...wait' then when I finally caught him and got my bag he asked me for a tip! Can you believe it? No way! Nana's friend Mohammed was supposed to meet me at the airport to guide me through immigration as we had heard that people were getting hassled for having expired entry stamps (mine was in fact expired as they only give you a month and you are supposed to go to immigration to renew but no one ever mentioned that to us and by the time I heard there was nothing I could do about it) but he never showed up. I waited in the checkin line in the non-ac'd room and sweated my face off. Checked in and waited for my bag to go through x-ray and then they called me over so they could search it. (bag search #1) They wipped it open and went through all my stuff in front of the whole check in hall as I sweated my way through the 'what is this'? and 'where did you get that?' questions. All was find in the end and my bag went through. Then I was on to immigration. I am still a little weirded out by the idea of being checked to get OUT of a country. It just doesn't seem right that they may not let me leave. Well, this is Africa...TIA. So, as expected the guy told me that my stamp was expired and that I would have to go to the immigration office in the morning. This of course was BS and I said, 'I am leaving tonight' and he said, 'okay then you can give me $50US.' hmmm...seems a little convenient for him. So, I asked him if I could get a reciept for the money. He gave me a strange look and that confirmed to me that the money was not for SLE but for his pocket. He told me I couldn't get a reciept and I told him I didn't have the money. We went back and forth and eventually he said that the guy who stamps the reciepts wasn't there that night and that $20 would do. I figured I would cut my losses and move on. I was quite proud of myself for negotiating as far as I did and headed to the airport bar (looked more like the basement of a church) for a beer to calm my nerves. I had to get through a security check next that included what I am convinced was a fake metal detector, bag search #2 on my carry-on which had liquids and electronics in it but no one seemed to care and pat-down #1. Seemed a little over-kill-y but I went along with it. The beer tasted even better after that. Eventually it was time to board. As we headed out to the bus that would drive us about 100feet to the plane I experienced bag search #3 (still full of liquids including insect repellant and electronics and food which, according to the sign at checkin wasn't allowed on board but no one said anything about any of it) and pat-down #2. Woo hoo. On board we pilled into our seats. The plane was rather empty but they had us sitting in full rows. Apparently we were to be full from Dakar to London so we were squished in enroute to Dakar. The dutch fella beside me was more chatty than I had hoped but I gave him one of my smuggled cookies and that quieted him down quite a bit. Flight was uneventful but, after being sick for two days, the single meal over 8 hours left me super hungry. Oh and the plane actually left Freetown 15 minutes EARLY! I suppose that's what happens when your passengers have to take transport to the airport that leaves 4 hours before the flight. Got to Heathrow and made it through immigration easily thanks to advice from Laura and knowing my address in Woking. I waited 50 minutes for my bag all the while thinking that my cab driver would have long since left and there was nothing I could do. At least my bag showed up! On my way out I got pulled over by customs and underwent bag search #4 and a long line of questioning. I really had nothing with me so it was no biggy. Got out and called the cab company and my driver hadn't left...thank God! We headed back to Woking, picked up my other bags and made it 'home'. The driver was funny. He basically threw my bags out of the cab and drove off leaving me to lug bags up two flights of stairs. Regardless I made it back in one piece. The apartment was a mess...I mean that as in it was obvious that my ADP friends had cleared out two weeks ago and no one had set foot inside since. Not their fault at all. I took some time to do a mad cleaning which made me quite happy, probably because I felt like I was taking care of myself again. I headed to the shop for toothpaste and some groceries, had a shower and headed into work grabbing a coffee on the way. YAY me! Susan took me out to dinner then I headed home to do some laundry and get to bed. It was a long couple of days with very little sleep so I slept very well! Saturday was a great day! Woke up early and went for a nice run. It was so good to be able to 'turn' while running (my beach run was VERY straight), to use my iPod (couldn't do that in SLE as I probably would have lost it) and not to hear 'go white girl' the whole time. The weather this weekend here has been gorgeous. Apparently I should visit more often as this is my second trip here with lovely weather! 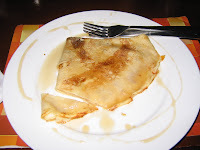 After a big breakie with loads of dairy I grabbed a coffee and headed into London to watch the Tour de France!!!!!!!!!!!!!!!!!!!!!!!!!!!!!!!!!!!!!!!!!! I know, it sounds strange that the tour started this year in England but trust me, it's a normal occurance to start in another country and I was just lucky enough to be here for it. 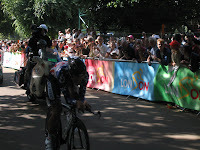 I spent the day in High Park on the bank of the Serpentine watching the first stage of the tour. It was AMAZING! There was a festival in the park with food and displays. I was so happy to be wandering around all on my own without even thinking of it. 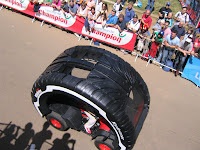 I saw the 'caravane' which was a ridiculous parade of sponosors (includi ng a tire car!) throwing out crap (hats, candy, body lotion) interspursed with riders warming up on the course. I stood right on the banner with a bunch of Aussies chatting about who we favoured for the race (go Kloden go!). It was so much fun. We were 2km from the end of the 9km individual time trial (the riders went off about 1 minute after each other) so I saw a lot of angry, gritted and spent faces on the riders. The PA systems on the team cars were booming cheering and screaming GO! in various languages right behind the riders. Man do they ever yell at their riders during a time trial. Their bikes were AMAZING and man is there ever not an ounce of fat on them and QUADS...my GOD! There was a couple of giant screens so you could hear Phil (the long-time tour announcer) and his cliches which are always worth a laugh. Too funny! I have a LOAD of photos of nothing as I couldn't take pictures fast enough. Here is one of Zabriske (a Canadian) during the race and I have a couple of Hincapie (the only guy to have been a teammate of Lance Armstrong on all of the Tours he won...a legend!) warming up. Wish I had a better, faster camera. It was wicked to say the least. Around 6 or so I realized I was EXHAUSTEd and decided to beat the crowd and head home. Grabbed a baguette at Waterloo station and rode the train back. On the way from the train I got more groceries and spoke to my parent's on the phone (yay) and then hung out while finishing my laundry. An amazing day! Sunday I watched more tour and Wimbledon (while eating strawberries and creme of course), went for another great run and did a bit of work. Another beautiful day here in England which made for another nice one. Cooked myself some chicken and peppers and got to bed early. July 5 - Later Salone! That's right ladies and gentlemen...today is my final day in Sierra Leone (affectionately called Salone here). It's a bright sunny day and I am starting to feel better after a rough night the details of which I will leave out. Let's just say I was ill. 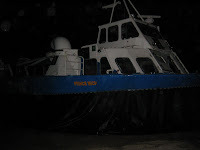 The crew is headed to Paddy's for indian dinner (glad I am feeling better) and then I get the hovercraft across the bay to the airport at 9pm for my 12:45am flight. I can't wait until I am on that plane. I always find going through all that airport rigamaroll a bit stressful especially on my own. It's been a phenominal 7 weeks. I can't say enough good things about this country. Keep your eyes on it because in 5 years time it will be the place to be for Europeans...and you can quote me on that! 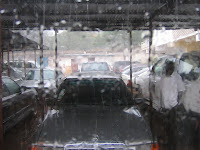 Just don't come in the rainy season! I'll miss the people and the sights for sure. Loads more work and adventure to come though so this isn't the end of my blog by any stretch of the imagination. Details of my departure adventure coming at ya early next week. Until then...happy sailing! July 4 - Rain has gone! Happy 4th of July to all my American friends!!! Just wanted to give a quick update. It's been a trying couple of days here as rain started on Sunday afternoon and stopped last night. We ended up hibernating at the hotel without connection to the internet. We survived and managed to make it into the office today. All the staff is on a retreat until Friday which is somewhat sad for me as I will be gone when they return. Oh well, makes for less goodbyes! Anyway, we are fine and back at it. I have about 1,000,000 emails to review so must get back to work. You are probably wondering about the 60%. First, it was definitely a great last weekend. The 60% is a bit of a joke. When they report the weather here on the radio the chance of rain is always 60%, even if it is actually raining. It’s quite funny. But I digress. I tried to keep my expectations about my last weekend here low so as not to be disappointed and I was not. Nothing was really planned but everything worked out fabulously. For the benefit of my O-town gals…lunge-worthy! Spent Friday night recovering from Thursday night’s ‘Goodbye Anna’ soiree [dinner at Roys then dancing at Paddy’s until 2] and working as I have to finish test conditions before I leave…it will be tight but I think I’ll make it. Saturday morning after my last morning beach run we headed off to do some souvenir shopping. Nana, Quirien, Laura and I hit the Lumley Craft Market, some stalls at the Aberdeen round-about and the Big Covered Market downtown. Market shopping was quite intense to say the least. The Big Market had two levels and three sections; crafts and weaving, cloth and jewelry/artifacts. We spent a good hour bargaining and browsing. Many times we were surrounded by women trying to get us to look at there wares. At one point I was wrapped in a sarong with fabric draped all over me, none of which I had asked for. It got a bit scary at moments but we took out time and I think everyone got what they were looking for. My powers of negotiation were okay but I usually managed to get things down to ½ of their first asking price. Regardless, this stuff was CHEAP. Nothing I bought was over $5. I just hope it will all fit in my suitcase. After the market we went for yummy lunch (including ice tea which I haven’t seen anywhere else here) then home for some more work and a nap. The plan for the night was dinner on the beach and then a visit to the casino in town. It didn’t quite turn out that way. We had dinner at Bunker Bar, a two-floor beach bar. I made sure to take in all the surroundings as I don’t know when I’ll get a chance to dine on the sand again. Laura said we needed to drop something off for her housemate at a party so we h eaded there. I won’t go into details but let’s just say that I spent my Canada Day drinking out of a coconut, watching an African drum troop and dancing at a nightclub until 5am. We never made it to the casino as it was closed by the time we get there. Ridiculous fun and a great way to spend my last Saturday! Sorry, no photos. There is a party tonight but I am way too tired to party again and have a big week coming up. 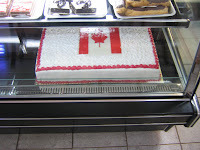 I do however know it will be great as I saw the cake at the top of this message at the bakery. No worries on the rest of my tattoos either… they are going to the party in my place. Hoping to have some photos of them later this week. 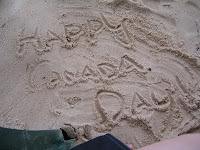 I know you all had a great Canada Day (those of you who are Canadian of course). Four more days here and one adventure to the airport which I am sure will be fabulous fun. I’ll be very sad to leave this place and these people behind but take with me some incredible memories, some new friends and some amazing experience. Oh, and photos of chimps and snakes too!